Edina is one of the most affluent communities the Twin Cities has to offer. Just southwest of Minneapolis with 45 neighborhoods, the luxury community had a median sales price of $380,000 in 2014, according to the Minneapolis Area Association of Realtors, and a population of more than 47,941, according the U.S. Census. In 2009, the city was even named one of Family Circle magazine’s “Top 10 Towns for Families” in the U.S.
With countless shops and upbeat restaurants, Fairview Hospital nearby, award-winning schools and parks, a thriving business community, low crime rate and near six major highways, Edina is the place to live and grow for families. 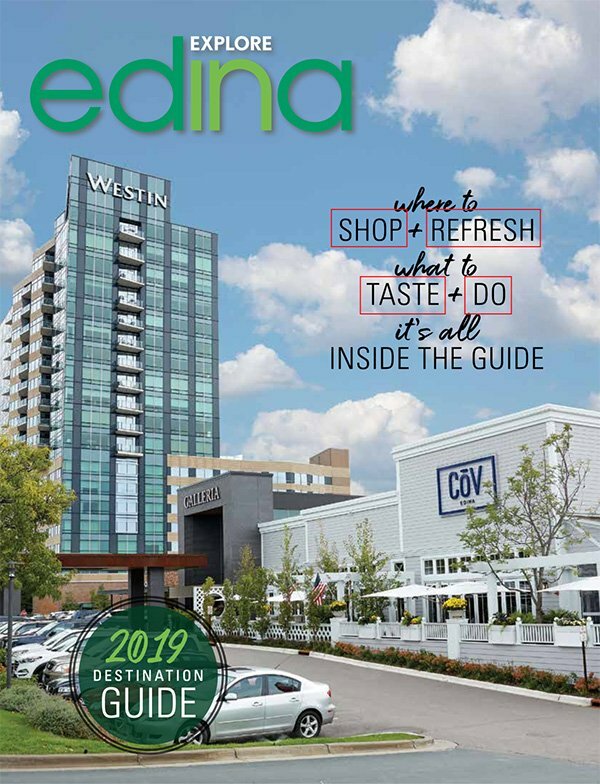 Southdale Center – Besides Southdale being known as the nation’s first indoor regional shopping center, it hosts 120 specialty stores – including anchor chains Macy’s, Herberger’s and JCPenney – with the latest trends and items for purchase. Even an AMC Megaplex with 16 screens connects for the whole family to catch the latest flick! 50th and France – With over 175 retailers, for those looking for upscale, classy restaurants and boutiques, 50th and France is the place to be seen. The district is also known for their annual outdoor art fair held in June as being the second largest in Minnesota with over 300 artists! Galleria – Anyone looking for sophistication and a high selection of quality, specialty items should visit the Galleria. The center hosts brands such as Tiffany & Co., Louis Vuitton and Gabberts Furniture while guests can also eat at distinct restaurants such as Big Bowl and Crave. Edina Grill – Perfect for the whole family to enjoy! Kids can enjoy divulging into Mickey Mouse pancakes or spaghetti tacos while adults can savor Pigs in a Poncho or classic Mac & Cheese. Tavern on France – American comfort food at its best and perfect for that after work Happy Hour! With a variety of food such as the Hawaiian Hangover and drinks such as the Tavern Limoncello Tini, the restaurant can satisfy anyone’s appetite and provide a good time. Edinborough Park – A unique indoor park that is great to hold birthday parties for children! Edinborough Park serves as a source of constant entertainment packed with fun family-filled events and features a junior-Olympic size swimming pool, running track and fitness area, a huge indoor playground, multi-purpose play area and amphitheater. Centennial Lakes Park – With a huge amphitheater, putting course, gardens, fountains, skating, fishing in the pond and sailboat races, it is the perfect day getaway for the whole family to make lasting memories anytime of the year. Visitors can also enjoy a walk, bike ride or jog along the nearby three-quarter mile Edina Promenade. Braemar Sports Complex –A new $1.4 million rink, dubbed “The Backyard,” features an arched metal roof, heated players’ benches and an environmentally-friendly icemaking system shared with the adjacent East Arena at the Braemar sports complex. Further expanding the outdoor sport season is Braemar Field, an inflatable sports dome with 100,000 square feet. The dome contains about 5.6 million cubic feet of air, kept in circulation by blowers that will also heat the interior to about 52 degrees. It is the second-largest such structure in Minnesota. The intersection of 50th & France has long been a cornerstone of. EDINA, Minn. (WCCO) — This weekend, more than 250 artists, exhibitors, food. By Sarah Thamer Updated: 03/13/2016 5:09 PM Created: 03/13/2016 10:50 AM Major.